The March meeting of the Florida Writers Association-St. Petersburg will feature Carolyn Handler Miller, a pioneering author/writer in the emerging field of interactive media. 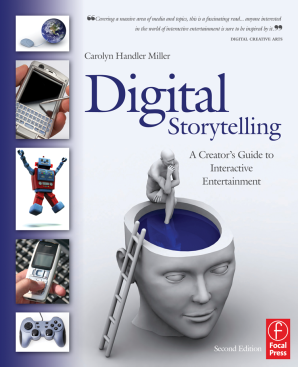 Miller, whose book Digital Storytelling: A Creator’s Guide to Interactive Media is in its second printing, will demystify the new arena of Digital Storytelling for local published and aspiring writers. She will also illustrate how film and television writers, journalists, promotional and marketing writers, and even novelists can use digital storytelling as a tool to more effectively engage their audiences. Since first entering the fast moving field of New Media in the early 1990’s Carolyn Handler Miller has contributed to over four-dozen interactive titles as a writer and content designer—a new profession she calls digital storytelling. These assignments included video games, projects for the Internet, interactive TV, intelligent toy systems, electronic kiosks and transmedia entertainment. She has been a frequent presenter-lecturer at national and international conferences and Universities, including the Maui Writers’ Conference in Hawaii, the Internet/Digital Television Summit in Paris and the African Broadcasting Network’s Screenwriting Lab in Johannesburg, South Africa. Millers splits her time between Los Angeles and New Mexico, where she has taught interactive narrative and video game development at the University of New Mexico and presently serves on the New Mexico Governor’s Council on Film and Media Industries. The Florida Writers Association- St. Petersburg monthly meetings are free and open to the public.